﻿ 2017 Coachman Laser 675 caravan review: the better twin? 2017 Coachman Laser 675 caravan review: the better twin? Something to aspire to? Why not? 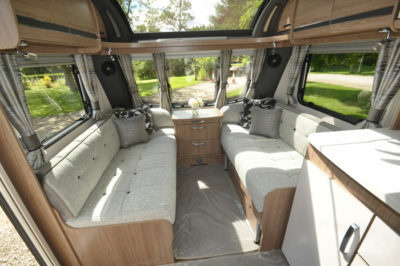 If you liked the look of Coachman’s VIP 575 last season – and it sounds like lots of caravanners did – how about the same end washroom/transverse island bed format, but bigger? That’s Coachman’s thinking for the Laser 675 – one of three twin axle Lasers for 2017, all four-berths. 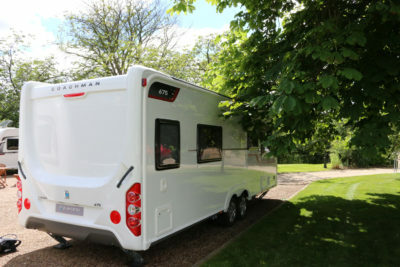 Indeed, Coachman goes against the grain somewhat these days in relying on its more traditional coachbuilding skills to stick with heavy-duty aluminium sides and polystyrene insulation, with the front and rear panels in ABS. It’s a fully bonded body, though, with polyurethane blocks for the internal framework. Graphics and colours are, as ever, new for the season ahead. Heavy-duty corner steadies and alloy wheels are standard Laser fare, although the spare is only steel. At the front, the fixed sunroof and Heki 2 rooflight beyond let the daylight flood in where you arguably want it most. That bed is just a tad longer than its rivals, too. It’s 1.88m x 1.35m and is flanked by wardrobes, with three lockers overhead. At the front, you can have a transverse double – 1.88m x 1.35m. Or, if you’ve got younger (shorter) children, you can have single beds at 1.52m x 0.72m. Arguably, there was little to do to improve the Laser’s extended kitchen. 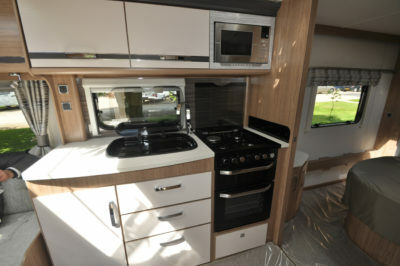 It’s down to detail tweaks now, like the additional LED ambient lighting, microwave surround and chrome detailing for the Thetford Aspire cooker. 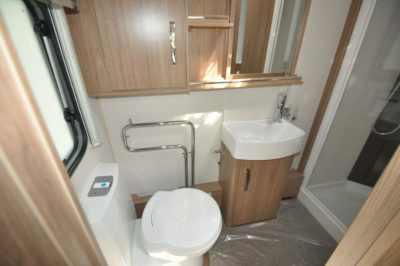 As has become the norm, now, for any caravan aspiring to be upmarket, the heating and hot water are via Alde’s “wet” system, with radiators throughout creating the cosiest of interiors. 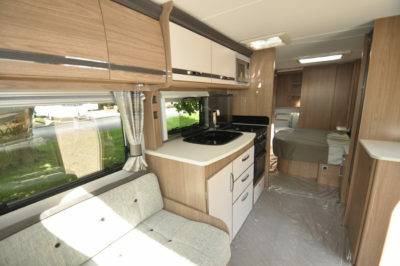 Also among the standard inventory are an on-board fresh water tank, lots more LED lighting (including touch-operated reading lamps in the lounge, with night-time setting), a Pioneer stereo system with USB and MP3 connectivity. It doesn’t extend to digital radio, despite the Status 570 TV aerial having such capability. Safety and security features including AL-KO ATC electronic anti-snaking, tilt sensor alarm, tracking device and axle wheel locks will qualify buyers for a number of insurance discounts. If the bedroom is palatial the washroom beyond it isn’t far off, either, making up in sheer space what it lacks in style. 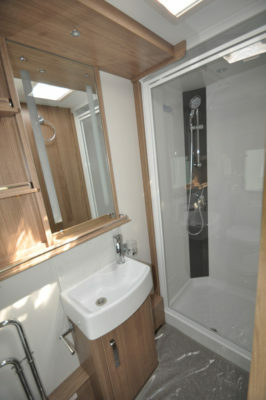 The shower cubicle in the nearside corner is all-plastic lined and is fitted out with Eco Camel’s latest Jetstorm Plus showerhead. There’s a fixed basin and there’s an all-important window beyond the toilet. Solid build is the Coachman way. You pay a bit more, and might not get it in terms of bling factor, but there are plenty of Coachman owners out there who’ll testify to their ability to stand up to conditions “out in the field”. Of course you need a heavy towcar. You can also upgrade that chassis to 1,900kg if conditions allow and/or are necessary. 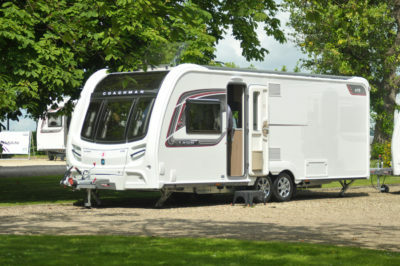 We’d love to hear what you think about the new Coachman Laser. Please add a comment below. 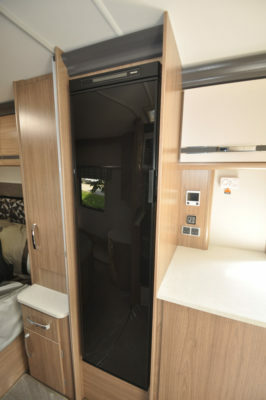 *Caravan insurance cost based on Coachman Laser 675 caravan retailing at £27,740 fitted with Phantom ProActive 3 tracker, PIR alarm and tilt sensors, Al-Ko ATC, hitchlock, and Al-Ko Secure axle wheel locks. Kept on drive at HX4 0BE. Caravanners over 30 years old, claim free for 3 years and a member of a caravanning club. £100 excess. 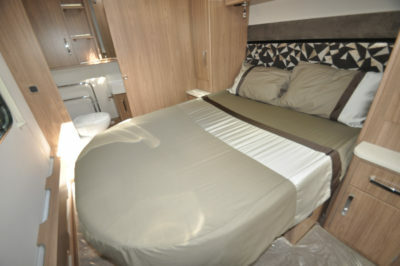 180 days European cover and up to £75 per day for up to 15 days emergency accommodation cover included. Legal expenses cover, extended European cover and other emergency ac-commodation expenses cover options are available at extra cost. Quote includes 10% online discount and 10% Insurance Premium Tax and is correct as of 18.10.16.